A binding referendum on approving an agreement which will bring a border dispute between Croatia and Slovenia to an international arbitration tribunal was held in Slovenia on June 6. Slovenia and Croatia have fought a diplomatic war since 1991 concerning land and water control in the small Bay of Piran, which is Slovenia’s only access to the sea. 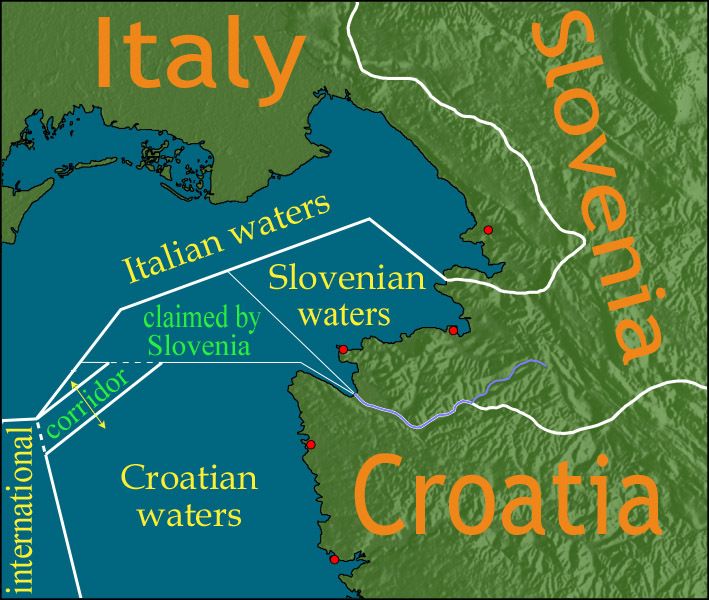 Slovenia’s current territorial waters are surrounded on all sides by other national waters – to the north, those of Italy and to the south, those of Croatia. Slovenian ships and fishermen thus have no access to the high seas through neutral international waters. Slovenia would like to expand its territorial waters to provide it a link to the high seas, something which Croatia opposes. Slovenia, an EU member since 2004, has used the dispute to veto Croatia’s bid to join the EU as the 28th member. Slovenian Prime Minister Borut Pahor, a Social Democrat, signed an agreement with Croatia in 2009 which would hand arbitration in the issue over to international arbitrators while Slovenia would stop blocking Croatia’s bid to enter the EU by 2012. 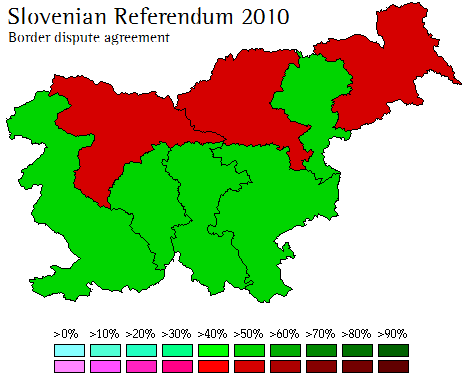 The deal was ratified by both national parliaments but the right-wing opposition in Slovenia was able to force a binding referendum on the issue. The Slovenian right denounced the agreement as a pro-Croatian capitulation. As in most referendums, voters also tended to answer the person who asked the question rather than the question itself. The Slovenian government isn’t extremely popular right now, so it explains the relative closeness of this referendum which some would assume would be a slam-dunk for the YES side. Do you support the implementation of the Law on the Ratification of the Arbitration Agreement between the Government of the Republic of Slovenia and the Government of the Republic of Croatia, which was adopted by the Slovenian Parliament at its session of 19 April 2010, becoming valid? Support for the agreement was greatest in the area directly concerned, that is, the Bay of Piran and Slovenia’s sole major harbour in Koper. One would assume that these voters, directly concerned by this issue, are supportive of a rapid arbitration of this issue and the development of better business relations with Croatia, which remains a major business partner. However, voters in the more mountainous and rural areas of eastern Slovenia voted against the agreement by a large margin. Nationalist rhetoric and distance from the issue likely explains part of their opposition, as does the area’s conservatism (it voted for the right in 2008 while the area which includes the Bay voted for the left). Full results are available here. The resolution of this issue comes as a relief for both Slovenia’s government – which has prevented an embarrassing defeat of its efforts of resolving bilateral disputes in the Balkans through compromise; and of Croatia’s government – which will now have a much easier road to EU membership which is likely to come as early as 2012. Slovenia seeks to make this agreement an example of conflict resolution in the historically tumultuous Balkans through peaceful compromise and agreement. Their optimistic hope is that it will influence relations between Serbia, Kosovo and Bosnia. The second round of a legislative by-election in Isère’s 4th constituency was held on Sunday, June 6. The by-election came as a result of the nomination of its long-time incumbent PS deputy, Didier Migaud, to the presidency of the FrenchCours des Comptes, by President Nicolas Sarkozy. As a result of the first round last week, Marie-Noëlle Battisel of the PS and Fabrice Marchiol of the UMP qualified for the runoff in which the former was heavily favoured due to the high weight of the left, which included the Greens and Communists, in the first round. Migaud, who commanded a massive personal vote had won 62.8% in the 2007 runoff in a constituency which Sarkozy had won 50.7% in on May 6, 2007. It’s quite obvious that Migaud’s strong personal vote hides a good number of things and makes a comparison or analysis of the UMP’s showing quite difficult. The bottom line is that the PS did about as well as it could, and the UMP did about as well as it could and that was relatively well considering the awful political climate for the right though its strong candidate (who is a Gaulliste social, thus a right-winger with larger appeal to the left – he does command a strong personal vote in his old mining community of La Mure) did help it out a bit. Comparing the results to that of March 2010, which is the best comparison because it did not involve Migaud and the party lines were similar, the PS improved narrowly on its 58% result back then, while the UMP did much better than its 29.95% showing in that race (where the FN weighed 12.1%). Amusingly, the left in the first round of this by-election weighed 58.75% – it won 58.38%. The interesting point about this election is the attitude of the UMP, FN and FG voters in the runoff. The FN voters will likely resort to apathy, but history shows that the UMP voters might prefer to vote for the EE candidate over the PS candidate – in the Grenoble-1 canton in 2004, a PS-Green runoff resulted in a Green victory (quite comfortable as well) because most right-wing voters voted Green over PS. A similar situation could happen here. The Netherlands’ lower house is up for re-election in a snap election which will be held on June 9, 2010. This election came as a result of the collapse of the fourth Jan Peter Balkenende cabinet in late February 2010 over the extension of the Dutch mission in Afghanistan. Balkenende’s Christian Democrats (CDA) support for an extension of the mission in Afghanistan led to the resignation of its junior ally, the Labour Party (PvdA). The Queen dissolved the House of Representatives, or, as it is more commonly known, the Tweede Kamer for a general election on June 9, less than four years after the last election in November 2006. The Netherlands uses one of the “purest” systems of party-list proportional representations. The 150 seats in the Tweede Kamer are allocated on the functions of vote casts in relations to seats, giving a threshold of 0.67% for representation. Party lists are headed by a top candidate or lijsttrekker. Parties may also form a list connection or Lijstverbinding in order to grant them more seats when the remainder seats are allocated – after the initial seats are allocated, the remainder seats are allocated using the d’Hondt largest averages method. The low threshold and national list system obviously makes it practically impossible for one party to form a government commanding a majority by itself. As a result, coalition formation is a long-winded process which is similar to the process which takes place in Belgium, with an informateur and formateur. The Netherlands is known to most people by vague misconceptions: it is, according to most, an extremely liberal country with a very permissive culture and legal system. However, that only applies to Amsterdam and other isolated towns. Furthemore, the country’s name is the Netherlands and not Holland. Dutch political history – and society – was long pillarized – similar to Belgium today. In a largely Protestant country but with a sizeable Catholic population, the country’s politics as well as society, labour structure and media was strictly organized according to four basic pillars: Protestants, Catholics, liberals (usually the secular or nominally Protestant elite) and the working-class. These four pillars, which was founded on the concept of sphere sovereignty, lived independently with their own party (or parties), trade unions, newspaper, schools, media sources and even hospitals or pastimes. This theory of sphere sovereignty was first expounded by the orthodox Protestant Anti-Revolutionary Party (ARP). The ARP was founded in 1879 as a conservative and orthodox reaction to the liberalizing Dutch Reformed Church. While originally anti-Catholic, supporting anti-Catholic legislation of the late 1800s, the party under Abraham Kuyper quickly came around to support pillarization. It aimed to break a bond between Catholics and liberals by pushing the main issue of pre-1918 Dutch politics: equalization of payment between public and religious schools, supported by both Catholics and Protestants but opposed by liberals. The ARP, however, was unsuccessful before 1917-1918 in passing equal funding for religious schools and also split internally over the issue of suffrage. Kuyper supported, after the 1891 election, a census reform which would give the vote to almost all males. However, the party’s aristocratic faction, which supported divine sovereignty over popular sovereignty, opposed the reform and formed a more anti-Papist splitoff which became known as the Christian Historical Union (CHU) after 1904. The CHU opposed cooperation with Catholics, which was the basis of Kuyper’s program (breaking the ‘anti-thesis’ of Catholic-liberal coalitions) as well as the census reform and the strong centralization of the ARP. A major political reform in 1917, first applied in the 1918 elections, gave the ARP and the Catholics the equal funding they wished in return for accepting universal suffrage and proportional-representation. This led to the achievement of Kuyper’s goal of a lasting Catholic-Protestant coalition. The Catholics, organized in the General League, a big-tent party for Dutch Catholics similar to the German Zentrum, had originally cooperated with the liberals because the liberals granted them more religious freedom. This ‘anti-thesis’ came apart as a result of the liberals’ refusal to equalize funding between state and private religious schools. The General League, a largely disorganized rag-tag collection of political Catholics, cooperated with the ARP and CHU in centre-right “religious” governments constantly between 1918 and 1933. The General League became the more organized Roman Catholic State Party (RKSP) in 1926 and garnered around 90% of the votes in the Catholic strongholds of Limburg and North Brabant – with the remaining Catholic votes going largely to the small Roman Catholic People’s Party (RKVP), a left-wing split-off of the General League formed in 1922 but which never enjoyed great success. Up until 1933, two pillars remained outside government. The oldest of the two were the liberals, which dominated Dutch politics after 1848, but whose comfortable position of power prevented them from forming a cohesive, structured and united party similar the ARP. The liberals were supported by atheists and progressive Protestants, representing the urban bourgeoisie (as opposed to the more rural and older nobility and Protestant upper-class which supported the CHU). However, the liberals (or the Liberal Union) were divided between conservatives and progressives with a smaller centrist faction in between. Conservatives opposed census reform proposed by Tak in 1891, while progressives favoured universal suffrage and other political reforms. These divisions, which grew over time, led to various splitoffs. In 1893 the progressives in Amsterdam founded the Radical League, which became the Free-thinking Democratic League (VDB) in 1901. In 1906 the larger conservative faction created the League of Free Liberals. The liberals lost most of their support with PR after 1918 (pre-1918 elections, under two-round single-member voting, allowed various liberal factions to unite in the runoff and win more seats), and this, in part, led the League to merge with smaller parties to form the Liberal State Party in 1921. The Social Democratic Workers’ Party (SDAP), the largest faction of the Dutch socialist movement, was founded in 1894 and led until 1925 by Pieter Jelles Troelstra. The SDAP, like most European socialist movements, moved away from Marxist revolutionary ideology to a more moderate and parliamentary course under Troelstra, though the rift between revisionists and radicals in the SDAP which led to the foundation of the SDP, the predecessor of the Communist Party (CPN) happened in 1909. The SDAP’s electoral audience grew slowly over time, though it remained outside government until 1939 (though the SDAP had supported liberal cabinets before 1918). During this same period of time, the SDAP grew more moderate – less republican, dropped its demand for national disarmament and so forth. Further on the fringes were the testimonial parties – ultra-orthodox Protestant parties who rejected any cooperation with the papist Catholics. The largest of these parties was the Reformed Political Party (SGP), a splitoff of the ARP founded in 1918 and known for its opposition to female suffrage. On the far-right, the Nazi movement in the country was led by the National Socialist Movement (NSB), of which Anton Mussert is the most famous leader. The NSB peaked at 8% support in the 1935 provincial elections. Following the end of World War II in 1946, many young reformers attempted to cause a doorbraak (breakthrough) in the political system and end the pillarized nature of Dutch society. As a move towards this goal, the VDB and SDAP united (along with a smaller Christian left party, the CDU) in 1946 and formed the Dutch Labour Party (PvdA). Their goal was to break the system by uniting Christians, socialists and liberals and breaking with the old stratified society, but this attempt was unsuccessful and the PvdA soon resumed close links with the linked organizations of the old SDAP. Disillusioned liberals left the party by 1948, and united with the small remnants of the Liberal State Party to form the People’s Party for Freedom and Democracy (VVD) – a liberal-oriented party in 1948. Meanwhile, the old RKSP was re-branded as the Catholic People’s Party (KVP) and the ARP and CHU remained strong – though the respective ideologies of these parties gradually changed. The ARP became nationalist and opposed decolonization in the Dutch East Indies, a position which excluded it from the first Willem Drees cabinet (1948-1951) which pushed welfare reform and decolonization. The KVP became the dominant party of Dutch politics in this period and held the top spot – Prime Minister – between 1958 and 1966. Under Victor Marijnen, the Dutch economy boomed. The years up to 1965 were the peak years for the KVP, but the KVP as well as the other confessional parties – the ARP, now becoming a more progressive Christian social party; and the CHU, still conservative, saw their fortunes fall as depillarization decreased their electoral audience. The ARP also suffered from an earlier split in the Reformed Churches (the church closest to the ARP) and the emergence of a new testimonial parties: the Reformed Political League (GPV), which was also quite anti-Papist but slightly less ideologically insane than the SGP. As in many countries, the late 60s ushered in new parties who sought to break the polarized and confessional nature of Dutch governments. In 1957, the Pacifist Socialist Party (PSP) had been founded by young left-wing dissidents of the PvdA and anti-Stalinist members of the CPNIn 1966, a group of students and activists led by charismatic journalist Hans van Mierlo founded Democrats 66 (D66), which sought a radical reform of the political system. 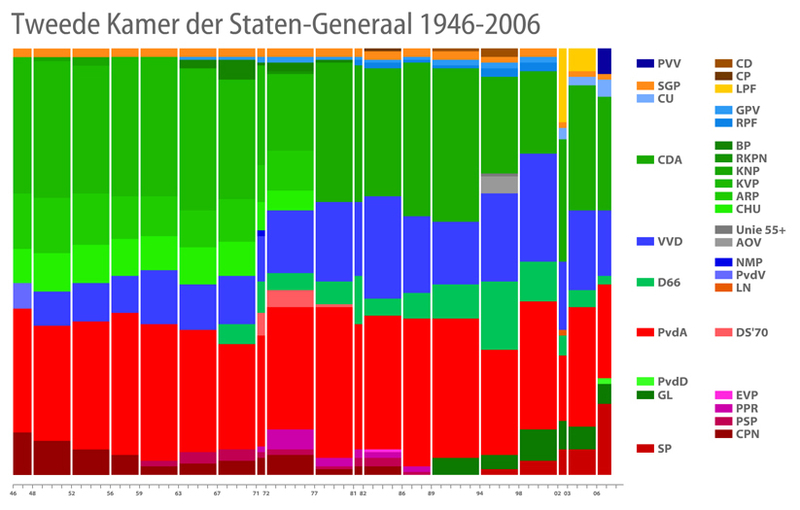 It obtained 7 seats in 1967 and 11 seats in 1971, and cooperated with the PvdA, which was excluded from right-leaning cabinets following the 1967 and 1971 elections. These right-leaning cabinets led in 1968 to the foundation of a new party formed by the progressive members of the KVP which became known as the Political Party of Radicals (PPR). In 1971, a “Progressive Coalition” linking the PvdA with D66 and the PPR failed to form government, which was formed by the KVP, which, despite losing quasi-steadily since 1967, was holding on to power along with the similarly embattled ARP and CHU. The Biesheuvel cabinet formed after the 1971 elections (consisting of the KVP, ARP, CHU, VVD and initially the right-wing splinter of the PvdA, DS ’70). In the 1972 elections, this Progressive Coalition managed to form a minority cabinet but only with the participation of progressive members of the KVP and ARP. The participation of the KVP and ARP weakened D66 and the PPR, but the Christian parties remained weak and quickly understood that something needed to be done. As early as 1967, cooperation between the three Christian parties had increased and they became closer allies. In 1973, a common federation consisting of the three parties was formed and the three parties competed as a common list in the 1977 elections under the name of Christian Democratic Appeal (CDA). A poor economic outlook and a personal conflict between Prime Minister Joop den Uyl and his Justice Minister, the Catholic Dries van Agt wrecked the government and forced elections in 1977. While the PvdA won a record 33% and D66 made minor gains (thanks largely to a new social liberal instead of radical democratic line – 1972 through 1974 had been especially bloody for the party), the PPR collapsed and coalition talks stalled between the CDA and PvdA. Finally, after more than 200 days of coalition wrangling, a narrow majority was obtained for a CDA-VVD cabinet, though it lost its majority in the 1981 elections as D66 doubled its seat count from 8 to 17. Only a CDA-PvdA-D66 cabinet could be formed, led by van Agt but with den Uyl as his deputy. This poor coalition fell apart by 1982 and forced new elections, in which D66 collapsed and a new government was formed by the CDA and VVD, a cabinet led by Ruud Lubbers (CDA). Lubbers, whose party won large victories in 1986 and 1989, led a popular (at the outset) policy including budget cuts, pension reforms and public service liberalization. The coalition with the VVD lasted until 1989, at which point Lubbers was forced to form government with the PvdA. Party lines moved again in the late 80s and early 90s. In 1989, the destalinized CPN (now on a New Left course) merged with the declining PPR, PSP and a smaller Evangelical Peoples’ Party (EVP) to form the GreenLeft or GroenLinks (GL). With 6 seats in the 1989 election, GL managed to put an end to the decline of the CPN-PPR-PSP-EVP block which had secured only 3 seats overall in 1986 (2 PPR, 1 PSP). During this same lapse of time, the PvdA moved further to the centre, becoming a party similar to Tony Blair’s New Labour in the UK. In the 1994 election, after a poor campaign by the CDA and declining popularity for its past policies, an unprecedented purple cabinet was formed between the PvdA, VVD and D66. D66 had done especially well in the elections, winning 24 seats, partly because of its efforts while in opposition. The new cabinet, formed by Wim Kok (PvdA) implemented social reforms (gay marriage, euthanasia, soft drug legalization) and centrist economic policies which proved largely popular in the 1998 elections in which both Labour and VVD made huge gains on the CDA (finishing third) and D66 (which lost 10 seats). The CDA had failed to adapt to life in opposition, being a party which had always been in government. In fact, the opposition to Kok came from its left – the GreenLeft and SP had been particularly vocal and successful in their opposition. The SP had won 2 seats in 1994, the first since its foundation in the early 70s as a Maoist splitoff of the CPN (it later dropped its Maoism); and climbed to 5 seats in 1998 while the GreenLeft won 11, up 6. However, increased immigration caused tension by 2002, tensions exploited by charismatic politician Pim Fortuyn, who was assassinated 9 days before the 2002 election. Fortuyn’s party, the LPF, was vocally opposed to increased Muslim immigration but was more liberal on social and economic issues. The LPF came second with 26 seats, while the PvdA collapsed to fourth, losing a full 22 seats. The VVD, growing more conservative on immigration issues, saw much of its vote fall to the LPF, and lost 14 seats. D66 saw its caucus trimmed by half. The big winners, apart from the LPF, were the CDA, led by the non-controversial Jan Peter Balkenende, which finished first with 43 seats, and the SP which won 9 seats. The GreenLeft won 10 seats. A new party, the ChristianUnion, a union of two testimonial parties – the GPV and the Reformatory Political Federation (RPF) won 4 seats. The ChristianUnion is right-wing on social issues (in the American sense of the term) but more left-wing on environmental and economic issues. The LPF was already growingly wrecked by internal divisions, but at the outset it formed cabinet with the CDA and VVD, though this cabinet collapsed after less than five months. In new elections held in 2003, the LPF collapsed to only 8 seats while the PvdA made major gains and the CDA and VVD solidified their positions. GreenLeft and D66 lost seats and the SP stagnated at 9 seats and proved unable to exploit its earlier high levels in polls because of tactical voting by left-wingers for the PvdA. The second Balkenende coalition, formed by the CDA, VVD and D66 took a tougher line on immigration (especially with the controversial immigration minister, Rita Verdonk of the VVD) and a right-wing policy on social programs which were criticized very vocally by the SP, which was rapidly gaining speed in polls thanks to its opposition to the EU Constitution but also to the right-wing economic policies of the Balkenende cabinet. D66 pulled out of government and caused snap elections for 2006. In 2006, the CDA remained stable losing only 3 seats, leaving it with 41 seats. Labour, led by Wouter Bos, fell 9 seats to 33 seats while the SP became the third party with 25 seats – a gain of 16 seats. The SP’s leader, Jan Marijnissen, was particularly popular. The VVD, led by the more liberal Mark Rutte, lost 6 seats and was left with 22 seats. The new far-right anti-immigration Party for Freedom (PVV) led by former VVD MP Geert Wilders did especially well with 9 seats. The GreenLeft lost 1 seat, leaving it with 7 while the ChristianUnion gained 3 for a total of 6. D66 again saw its caucus dwindle by half from 6 to only three MPs, while a new party, the Party for Animals (PvdD) won 2 seats, tying with the SGP. The LPF, hopelessly divided, lost all seats, most of its voters voting for Wilders’ new party. The new coalition was an unruly coalition formed by the CDA, PvdA and CU. Afghanistan brought down the government, and the failure of Balkenende to keep cabinet together has reflected poorly on his party. Meanwhile, after 2009 which was focused quasi-exclusively on immigration and exploited by Geert Wilders’ PVV which won 17% in the Euros, the issue of immigration has not been as present in this campaign as one would expect it to be. There were also changes in style and leadership ahead of the vote. Wouter Bos stepped down from the leadership of the PvdA in favour of Amsterdam mayor Job Cohen, much more popular and less tainted by the cabinet crises than Bos was. The SP, which lost a good leader in Jan Marijnissen when he stepped down in 2008, elected a new leader, Emile Roemer, in 2010 to replace the poor successor of Marijnissen, Agnes Kant. Marijnissen’s more conservative line on immigration in 2006 had played a part in the party’s success, winning many white working-class voters from Labour. In 2009, the PVV swept those voters and the SP has failed to solidify its gains with those voters. The VVD, which has long advocated economic reforms (in the right-wing liberal sense of the term) and has been divided on the issue of immigration, took a tougher line on immigration this year despite its leader being the more liberal and pro-immigration Mark Rutte, who took the party’s leadership in 2006 over Rita Verdonk, who has since left the party to found her new outfit – Proud of the Netherlands (TON) which briefly led in polls back in 2008 but has since collapsed entirely. The VVD campaign is thus more right-wing on immigration and budget cuts which are, very surprisingly, supported by voters. The focus on economic issues in this campaign has hurt Wilders – who has a leftist economic policy – and Cohen, who is poor on economic issues. Cohen could not sustain a PvdA advantage in polls back in April. D66 and its leader Alexander Pechtold gained a lot in 2009 from being the most vocal opponents of Wilders’ far-right. Since then, a shift in popular focus from Wilders/immigration to economics has left D66 squished between the VVD and PvdA and losing most of its 2009 supporters to both parties. The two main testimonial parties – CU and SGP – have remained unsurprisingly stable. 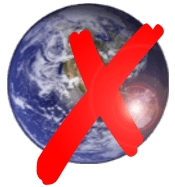 I like to mention, for no real reason apart from fun, that the SGP still believes in male-only suffrage and party membership, rejects freedom of religion (it supports freedom of conscience), supports a theocracy, supports the death penalty and it closes its website on Sundays. These parties have strong support in the Protestant Bible Belt which stretches through rural central Netherlands and also includes the famous insular community of Urk. The VVD coming first throws a lot of coalition predictions flying. Will Mark Rutte become the first liberal Prime Minister since 1918? Will he govern with the right and centre (CDA, D66, CU) or with the left (PvdA, D66)? What will be the government’s immigration policy, a topic which is of most interest to foreigners. A majority is 76 seats, and here are the most likely coalitions (on the assumption that VVD and SP don’t go together, that SGP remains outside government but CU can go inside). The second and third options are the ones I would place my bets on.